RGVN facilitates sustainable farm-livelihoods and sustenance post-project. The chief focus is large scale capacity building of small and marginal farmers to facilitate adoption of improved technologies and practices to attain rapid growth in farms enabling them to access mainstream markets to sustain the economic gains. In spite the fact that many small and marginal farmers hold on an average one to two hectares of land respectively, agricultural practices are quite primitive and production is low. Vast resources in the form of land and water yet remain unutilized. Three major projects are being undertaken in Assam. The first is a project with Concern Universal (CU) funded by the European Union (EU) for productivity enhancement in six districts of Assam; the second is popularising System of Rice Intensification (SRI) as a mission in Assam, and the third is productivity enhancement of lead crops in the Barpeta District covering five villages and 5000 households. Another area that RGVN advocates is vermicompost, since chemical fertilizers have rendered vast patches of land useless and depleted the natural fertility of land. Besides Assam, vermicompost projects are being carried out in Vaishali and Muzzafarpur in Bihar and Dhenkanal and SARC, Sambhalpur District of Odisha. The project aims to empower 14,000 farmers covering two blocks in each of the seven districts namely Dhemaji, Kamrup (Rural), Barpeta, Nalbari, Baksa, Bongaigaon and Chirang of Assam. RGVN is implementing the project in Chenga & Barpeta blocks of Barpeta district and Dhemaji block of Dhemaji district with a target of 2000 mahila kisan in Barpeta and 1000 mahila kisan in Dhemaji district. Read more..
RGVN has been one of the pioneers in introducing SRI (System of Rice Intensification) to Northeast India beginning 2007, a resource conserving technology management system. From then on RGVN reached out to more then 10, 000 farmers in 26 districts of Assam covering more than 5000 acres of land. During its promotional venture RGVN received grants form agencies like Sir Dorabji Tata Trust (SDTT), National Bank for Agriculture and Rural Development (NABARD), North East Development Financial Corporation (NEDFi), Power Grid and the Numaligarh Refinery Limited (NRL). Most of the farmers are small, owning about 1-3 acres of land. Presently RGVN is promoting SRI in the 12 districts of Kamrup, Goalpara, Nalbari Darrang, Morigaon, Golaghat, Lakhimpur, Tezpur, Sonitpur, Cachar, Karimganj and Hailakandi. The Sir Dorabji Tata Trust (SDTT) has been providing financial assistance to RGVN since 2008 for boosting promotion and expansion of the System of Rice Intensification. The project is under implementation in the districts of Kamrup, Darrang, Nalbari, Morigaon, Goalpara, Cachar, Karimganj and Hailakandi and running for the past two years. 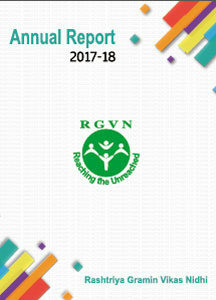 To facilitate extensive promotion of this novel technique RGVN had resourcefully managed to garner the active involvement of various external agencies and officials like KVK’s, District Agricultural Officers, Agricultural Development Officers and the State Agricultural Department to name a few. With the objective of motivating small and marginal farmers of the Golaghat District of Assam, and to enhance food security with respect to food grain, an initiative was taken by the CSR (Corporate Social Responsibility) department of Numaligarh Refinery Ltd., to promote SRI in some of the potential rice pockets of the district. The project was implemented by RGVN for the first time ever in the district for Sali paddy (Winter Rice) season of June 2011. The outcome of the project was encouraging with RGVN being able to reach out to 264 rice growing families amidst several situational and environmental constraints. A total of 76 acres of land was utilized for SRI demonstration purpose in the selected rice growing pockets of the district. The production of the adopted SRI farmers doubled and NRL assisted another project to sustain the SRI methodologies amongst the farmers. The Corporate Social Responsibility (CSR) department of Power Grid Corporation of India Limited, Meghalaya also made sufficient contributions by sponsoring SRI in the Darrang District of Assam during the FY 2010-11. RGVN implemented the project by engaging a local NGO called SATRA (Social Action for Appropriate Transformation and Advancement in Rural Areas). The project reached out to 300 farmers with a overwhelming success. RGVN has also been directly implementing promotion of SRI under the NABARD sponsored Farmers’ Technology Transfer Fund (FTTF) in the Barpeta, Lakhimpur and Sonitpur Districts of Assam since the year 2010. In the first year RGVN adopted 1000 farmers covering 313 acres of land under Boro and Early Ahu crop. Average yield recorded under SRI rose to 14.2 quintals per bigha while under the conventional system it was 8.6 quintals per bigha. The project is running smoothly in the districts this year also covering 1645. In addition to the above projects RGVN has recently initiated a project on augmenting productivity of some selected crops in the Chenga block of the Barpeta District under NABARD sponsored project called Augmenting productivity of lead crops and activities through adoption of sustainable agricultural practices. The main focus of the project is on enhancing the yield of leadcrops like rice as cereal crop, jute as fibre crop, rapeseed and mustard as oilseed crop and rabi vegetables such as tomatoes and potatoes. The Project encompasses providing necessary support to the farmers throughout the cultivation period including harvesting, grading and marketing of the produce. RGVN provides funds for livestock farming, especially piggery and dairy. It is seen that the livestock sub-sector has emerged as one of the key components of agricultural growth in recent years. As a result of gradual transition from subsistence to market system, the economic dimensions of livestock have assumed increasing significance. Over 70 percentage of the poor rural households depend on livestock farming for supplementary income. The sector is highly gender sensitive and over 90 per cent of activities related to care and management of livestock are carried out by family’s women folk. In the Northeast, piggery is a major source of supplementary income, especially for tribal communities. Women have the traditional skills to rear pigs and markets are also readily available in the local area. A cluster approach with some amount of scientific inputs will make it more profitable and check migration to other areas. Areas undertaken are North Sikkim in Sikkim and Southern districts in Mizoram like Lunglei, Lwangtlai and Chimtuipui. Dairy has extremely high potential in generating better income and food security throughout the country. During the next three years RGVN is concentrating on two dairy clusters. Jajimukh in Jorhat District of Upper Assam and Gajapati and Nayagarh District of Odisha. The handloom and handicraft sector has the potential to raise the income of poor persons, especially women, all over the Northeast. In the North Eastern States most women have traditional skills in weaving and if these skills are enhanced and new markets explored, income levels can rise substantially. Certain clusters are being developed in Kamrup District of Assam, Aizawl in Mizoram and in Borjola in Tripura. Traditionally dwellers of forest areas have depended upon Non Timber Forest Products (NTFP) as a traditional source of livelihood. In recent years the availability of forest produce is declining due to unscientific harvesting and the control of the products by unscrupulous traders and middlemen. Flowers of the mahua tree, sal leaf plates, char seeds and tola are the main NTFPs adding income to the poorest of the poor of the block. Other NTFPs such as amla, harida, bahida, edible jungle mushroom and honey add substantial income. While traditional skills exist, these are mainly limited to traditional harvesting and processing methods that do not offer any value addition. Hence technology upgradation, reorganization of SHGs, formation of Cooperatives and Bank linkages will provide the backdrop for viable entrepreneurship for women.While some amount of work and investment has already been made in this sector by RGVN, the next logical step would be to strengthen the sectoral work. This would be taken up at Keonjahar District of Odisha and Chhattisgarh.